Introduction: Staple line reinforcement (SLR) has been used to prevent staple line leaks and reduce bleeding in a variety of surgical procedures. Tissue extrusion and slippage from stapler jaws can affect tissue handling and the number of staple loads used during a procedure. We hypothesized that tissue handling and extrusion with stapler closure and firing depends on the use and type of staple line reinforcement. Methods and Procedures: Two different SLR materials were evaluated: GORE SEAMGUARD® Bioabsorbable Staple Line Reinforcement (W. L. Gore & Associates, Inc., Newark, DE), a synthetic bioabsorbable copolymer of glycolic acid and trimethylene carbonate with a porous fibrous web structure, and Duet TRS™ Reload with Tissue Reinforcement (Covidien, Mansfield, MA), a synthetic absorbable film prepared from synthetic polyester composed of glycolide, dioxanone, and trimethylene carbonate. Using an ex vivo canine gastric tissue model, three experimental groups were tested (Seamguard, Duet TRS and no SLR; n=4 firings each) using Autosuture ENDO GIA™ Universal Staplers with a 45mm long, 2.5mm single use loading units (SULU) (Covidien, Mansfield, MA). Tissue extrusion during stapler closure and firing was quantified using standardized reference marking, and the ability to grasp and hold the canine stomach against gravity was evaluated during 5 attempts. Significance between groups after stapler firing was determined using Wilcoxon signed rank testing. 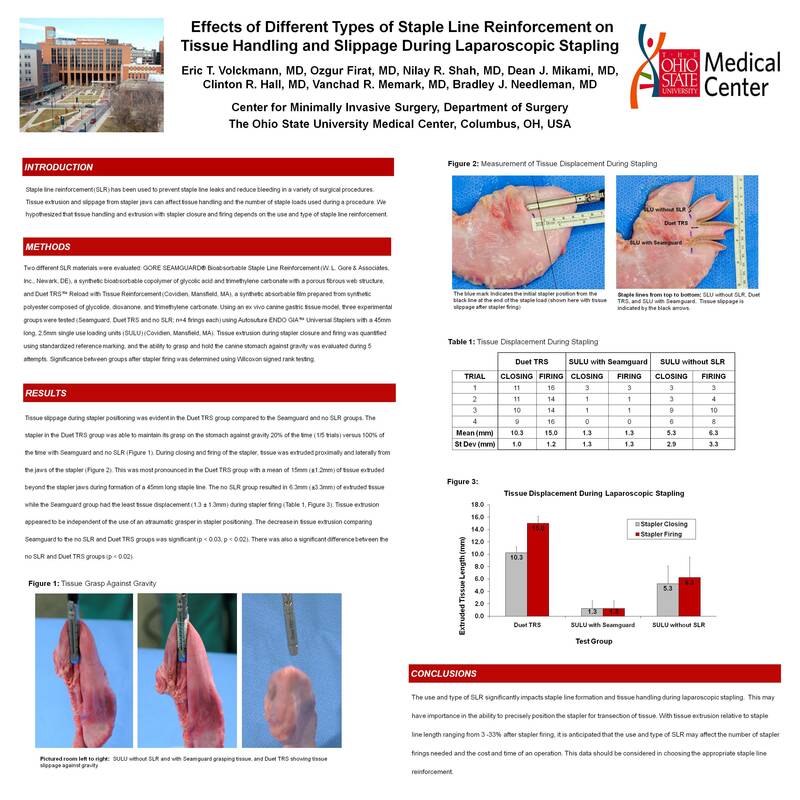 Results: Tissue slippage during stapler positioning was evident in the Duet TRS group compared to the Seamguard and no SLR groups. The stapler in the Duet TRS group was able to maintain its grasp on the stomach against gravity 20% of the time (1/5 trials) versus 100% of the time with Seamguard and no SLR. During closing and firing of the stapler, tissue was extruded proximally and laterally from the jaws of the stapler. This was most pronounced in the Duet TRS group with a mean of 15mm (±1.2mm) of tissue extruded beyond the stapler jaws during formation of a 45mm long staple line. The no SLR group resulted in 6.3mm (±3.3mm) of extruded tissue while the Seamguard group had the least tissue displacement (1.3 ± 1.3mm) during stapler firing. Tissue extrusion appeared to be independent of the use of an atraumatic grasper in stapler positioning. The decrease in tissue extrusion comparing Seamguard to the no SLR and Duet TRS groups was significant (p < 0.03, p < 0.02). There was also a significant difference between the no SLR and Duet TRS groups (p < 0.02). Conclusions: The use and type of SLR significantly impacts staple line formation and tissue handling during laparoscopic stapling. This may have importance in the ability to precisely position the stapler for transection of tissue. With tissue extrusion relative to staple line length ranging from 3 -33% after stapler firing, it is anticipated that the use and type of SLR may affect the number of stapler firings needed and the cost and time of an operation. This data should be considered in choosing the appropriate SLR.